This month, in partnership with the Office of Community Engagement at Concordia, and the Imani Community Centre, which is operated by Muslim Association of Little Burgundy, COCo is excited to announce a workshop with members of Movement for Justice in El Barrio. This workshop focuses on doing effective outreach and building strength and analysis to different sectors of your community to build your organization and the movement for social justice. Attendees develop a toolbox of effective methods and messages to reach people in their communities and build the base of their organizations. The discussion for this event will focus on building connections between diverse parts of our communities with very different needs and interests, and making connections between the different organizations and people of Little Burgundy. You can sign up for free, here, on our eventbrite page. The workshop will be facilitated by members of Movement for Justice in El Barrio. 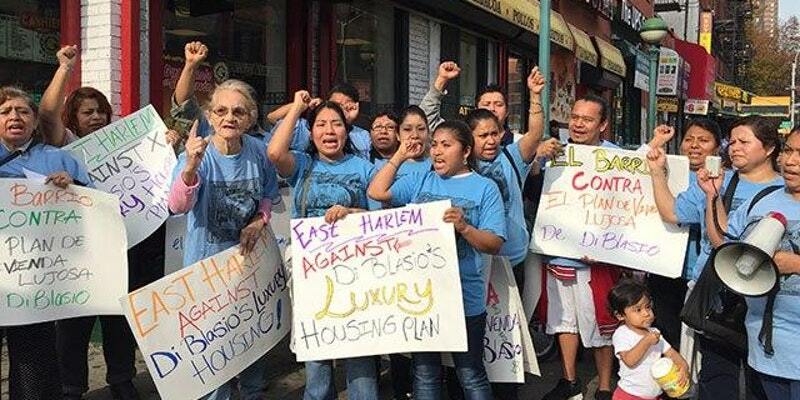 Movement for Justice in El Barrio is a uniquely inspiring organization, led by hundreds of women of colour living in the working class immigrant communities of East Harlem. Among other things, MJB’s practice of direct democracy, the remarkable success of their bottom-up organizing, and the victories they have had fighting for housing rights in their community, are reasons to come and learn from their tactics and strategies. We are hoping this workshop will be particularly useful to communities of colour and migrant communities working around housing, access to services, and the general wellbeing of our neighbourhoods. We will be announcing a second event with Movement members shortly. Stay tuned! Whisper translation into French will be provided. Breaks and lunch will be provided. Participants will be encouraged to come and go as needed. Please let us know any specific needs you have regarding food by responding to the question about that on this registration form. Language the event will take place in English. If you need whisper translation into French, you can let us know in the registration form and we will provide it. The building is wheelchair accessible and has automatic doors. The bathrooms are gender-neutral and wheelchair accessible. The bathroom doors are not automatic, but there will be volunteers designated to open doors. Please let us know if you have specific questions or concerns about bathrooms. We ask participants to minimize the scents they wear (deodorants, perfumes, scented soaps, etc) before coming. We cannot guarantee it will be a scent-free space. Please specify on the registration form if you have specific concerns. There will be métro / bus tickets available for people who need them. There will be non-fluorescent lighting at the event. The closest metro station is Georges Vanier, which is 8 blocks from the building. The 57 bus runs by the venue.